The challenge for us to love each other is peppered throughout the scriptures but can we honestly say we love our neighbour as ourselves? This is something that has always bugged me because it’s easy to love our friends and family but what about the weirdo who lives across the street or the people who gossip about you behind your back? What about that work colleague who swears at you or that boss who you are sure hates you? As an introvert I am not always comfortable around people I don’t know, so it is always a challenge to me to make sure I appear warm and friendly even if I don’t feel like it on the inside. However, Jesus is not asking us to “fake it.” It’s a command! So how do we do it? 1 John 4 tells us that love comes from God. Jesus said to “Love one another…..AS I HAVE LOVED YOU.” The key in all of these scriptures is in receiving love from God. 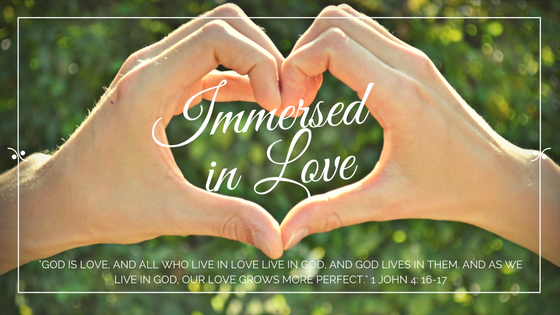 We are to immerse ourselves in His love and the more we are immersed in His love, the more love we will have for others. If we are struggling to love others, then we are not fully consumed with God. Love should be a testimony of our faith. Perhaps for some of you your first challenge is to accept and receive God’s love for you. Recognise that you are His child and He loves you, He adores you, He gave His life for you! Secondly, you need to love yourself. Perhaps some of us struggle with this concept but it is crucial we love and accept ourselves. You are God’s creation and by hating or loathing yourself you are saying, you don’t like what God has created. “You formed my innermost being, shaping my delicate inside and my intricate outside, and wove them all together in my mother’s womb. I thank you, God, for making me so mysteriously complex! Everything you do is marvellously breathtaking. It simply amazes me to think about it! carefully, skilfully shaping me from nothing to something. You saw who you created me to be before I became me! Before I’d ever seen the light of day, the number of days you planned for me were already recorded in your book. If you can’t love yourself, how can you love others? God wants to saturate you with His love. Finally, we need to immerse ourselves in God. All-in with Jesus! We should be one with Him. When there is more of Him, there will be less of us. In our humanity we can not love as God commands us to, but when we abide in Him and He in us, that love will fill us and overflow through us. We are God’s representatives on the earth and His desire is to emanate in us and through us for the world to know and experience His amazing and outrageous love for all of mankind. Next Are You Hearing But Not Listening?